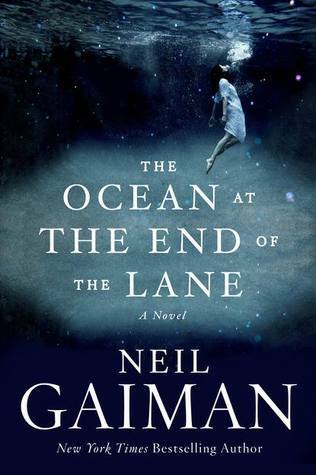 There's a reason why I love reading Neil Gaiman books, and this book strengthens how much I love his stories. He's such an amazing storyteller. I was instantly swept off my reading feet and transported into this amazing tale. When a man returns home to attend a funeral, he ends up visiting the place he grew up. But ends up at the end of the lane. Where a lake sits. A pond that the property owners insist is actually an ocean. While at the farmhouse memories swamp him, taking him back to the incredible events that happened when he was seven. When he met an older girl called Lettie Hempstock and her kind family. During a time when he got caught up in a magical yet super spooky situation. This book is moving, beautiful and filled with wonder. I felt so bad for the narrator--we never find out his name--who was so very lonely, and misunderstood. He suffered through so many sad events. :( I also loved how he was a big reader and found comfort in all kinds of books. Neil Gaiman sure writes incredible stories. He also writes incredible, strong women. And memorable characters.